Irwin Bazelon died on August 2, 1995 at the age of seventy-three. His untimely death occurred just two months after the completion of a recording of three orchestral works with the Bournemouth Symphony Orchestra. All told, he composed nine symphonies and over sixty orchestral, chamber and instrumental pieces. He was writing his Tenth Symphony, from which Prelude to Hart Crane’s “The Bridge” had been performed and recorded in 1992. Born in Evanston, Illinois on June 4, 1922, he graduated from DePaul University, with both a bachelor’s and master’s degree in music. After studying composition with Paul Hindemith at Yale for a short time, he went to Mills College in Oakland, California to work with Darius Milhaud. In 1948 he moved to New York City. His rhythmically complex and often jazz-tinged music bristles with the tension, energy and hustle-bustle of contemporary urban life. In his early years in New York, Bazelon supported himself by scoring documentaries, art films and theatrical productions, including two American Shakespeare Festival plays. During the 1950s and 1960s he composed more than fifty scores of this kind, which proved to be an invaluable preparation for his orchestral music. Among these was his signature theme for NBC News programs, arguably the most famous eight seconds of music in the 1960s. In a valedictory of sorts, he wrote Knowing the Score: Notes on Film Music. Published in 1975, this book is widely used as a text in colleges and universities. As a guest composer, he lectured at many schools, including Rutgers University, Williams College, the University of South Carolina, Eastman School of Music, the University of Wisconsin, Oberlin College, Rice University, the University of Virginia, the University of Arizona and the University of Akron. In England he was a guest of the Royal Northern College of Music in Manchester and the University of Sheffield. As an authority on film music and a master composer, young people were drawn to his feisty spirit and no-nonsense approach to earning a living by applying compositional talents to the commercial world without sacrificing integrity. Bazelon’s works for orchestra, chamber ensemble, solo instrument and voice have been performed throughout the United States and Europe. He conducted his music with such orchestras as the National Symphony, the Detroit Symphony, the Kansas City Philharmonic and Frances Orchestre Philharmonique de Lille. He received grants and commissions from the National Endowment for the Arts, the Koussevitzky Foundation “for his contribution to American music” the Fromm Foundation, the Kansas City Philharmonic, the New Orleans Philharmonic, the American Brass Quintet, the Boehm Woodwind Quintette and the Royal Northern College. 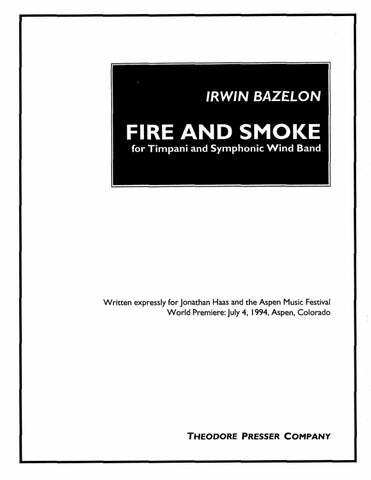 His Fire and Smoke for symphonic wind band opened the Aspen Music Festival in June, 1994. A long time horse racing enthusiast, one of his best known works, Churchill Downs (Chamber Concerto No.2), is named for the home of the Kentucky Derby. In some small way, the racetrack helped launch Bazelon’s symphonic career. With the money from a big win at Aqueduct, he recorded a concert ballet with sixteen members of the New York Philharmonic, the tape of which led directly to his conducting his Short Symphony (Testament to a Big City) with the National Symphony in Washington, D.C. in 1962. This was his major orchestral debut. for Solo Viola and Chamber Ensemble 15:00 Solo Vla.;1(Picc.) 0 2(B.Cl.) 0 – 1 1 0 0; Perc. Pno. Vcl. Cb. 12:00 Solo Tu. ; 2Vln. Vla. Vcl. 15:00 1 1 2(B.Cl.) 1 – 1 2 1 0; Perc. Pno. Vla. Cb. 12:00 Fl./Picc. Cl. Vla. Vcl. Pno. Perc. 14:00 1(Picc.) 1 1(Eb Cl.) 1 – 2 2 0 1; 2Perc. Pno. Vla. Vcl. 17:00 5(Picc.) 2(E.H.) 3(B.Cl.) 3(Cbsn.) – 4 3 3 1; Timp. 4Perc. Pno.(Cel.) Hp. Str. 10:00 1(Picc.) 1 1 1 – 2 2 1 0; Timp. 3Perc. Pno. Str. 18:00 3 3 4 3 – 4 3 3 1; Timp. 4Perc. Pno. Str. 20:00 3(Picc.) 2 3(B.Cl.) 3(Cbsn.) – 4 3 2 1; Timp. 5Perc. Str. 18:00 2 2(E.H.) 2(B.Cl.) 2(Cbsn.) – 2 2 1(B.Tbn.) 0; Timp. Perc. Pno. Str. 11:00 2Tbn. and Solo Perc. Centauri 17 23:00 1 1 2(E-flat Cl. B.Cl.) 1 – 1 2 0 1; Theremin or Lyric Soprano 3 Perc. Pno. Vla. Vcl. Cb. 10:00 3 3 3 3 – 4 3 3 1; Timp. 3Perc. Pno. Str. for Solo Brass Quintet and Orchestra 20:00 3 2 4(EbCl. B.Cl.) 3(Cbsn.) – 3 2 2 1; Timp. 4Perc. Pno. Str. Brass Quintet: Hn., 2Tpt., Ten.Tbn., B.Tbn. for Solo Cello and Orchestra 20:00 Solo Vcl. ; 3(Picc.) 2 3(B.Cl.) 2 – 2 2 2 1; Timp. 4Perc. Str. for Percussion Quartet and Orchestra 25:00 4Perc. Soli; 3(Picc.) 3(E.H.) 3(B.Cl.) 3(Cbsn.) – 4 3 3 1; Timp. Pno. Str. for Orchestra 17:00 Soprano; 3(Picc.) 2 4(Eb Cl./B.Cl.) 3(Cbsn.) – 4 3 3(B.Tbn.) 1; Timp. 4Perc. Pno. Str. for Solo Trombone and Orchestra 12:00 Solo Tbn. ; 3(Picc.) 2 3(B.Cl.) 3(Cbsn.) – 4 3 2(B.Tbn.) 1; Timp. 4Perc. Pno. Str. for Solo Clarinet, Trumpet, Marimba and Orchestra 20:00 3(Picc.) 2 3(B.Cl.) 2 – 4 3 3 1; Timp. 4Perc. Pno. Str. 22:00 3 3 4 2 – 4 3 3 1; Timp. 4Perc. Pno. Cel. Str. for Brass, Piano and Sextet 22:00 0 0 0 0 – 4 6 4 2; 4Perc. Pno. Cel. Sextet: Fl.(Picc.) 2Cl. (E-flat Cl. B.Cl.) El.Gtr. Vla. Vcl. 30:00 4 3 4 3 – 4 3 3 1; Timp. 5Perc. Pno. Cel. Str. 25:00 3(Picc.) 2 4 3 T.Rec. – 4 3 3 1; Timp. 5Perc. Pno. Accord. Str. Ballet for Orchestra 18:00 3 2 4 3 – 4 3 3 1; Timp. 4Perc. Amplified Pno. Str. 12:00 3(Picc.) 2 3(B.Cl.) 2 – 2 2 2(B.Tbn.) 1; Timp. 3Perc. Pno. Str. 15:00 3(Picc.) 3(E.H.) 2 2 – 4 3 3 1; Timp. 4Perc. Pno. Str. for Timpani and Symphonic Wind Band 8:00 Solo Timp. ; 3(Picc.) 2 4(Eb Cl., B.Cl.) 2 – 4 3 3(B.Tbn.) 1; 4Perc. Bazelon’s work combines a continuum of tension in the form of constantly overlapping held notes with an open spacious flurry of arpeggio and scale figures. High points come with the brief volume flairs led by the percussion; tranquility reigns from start and finish. …beginning [with] disjointed phrases, punctuated by what the composer called “impact accents.” … the silences between these phrases were as significant as the clusters of notes themselves… evocative of the pounding beats of the horses’ hooves as they rounded the track. …engrossing with its rhythmic, lyric, and coloristic imagery and harmonic change. 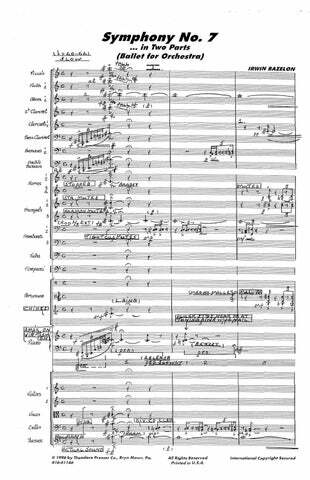 …sheer power and drama … clearly one of the great symphonies of the twentieth century.